PERU 8 ESCUDOS GOLD DOUBLOON – COB ~ NGC 58 ~ "SINGLE YEAR TYPE!" FINEST KNOWN OF ONLY 3 EVER GRADED (now Tied for FINEST Kn. of 4 Total)! HAS THE HIGHLY SOUGHT AFTER "2nd DATE!" 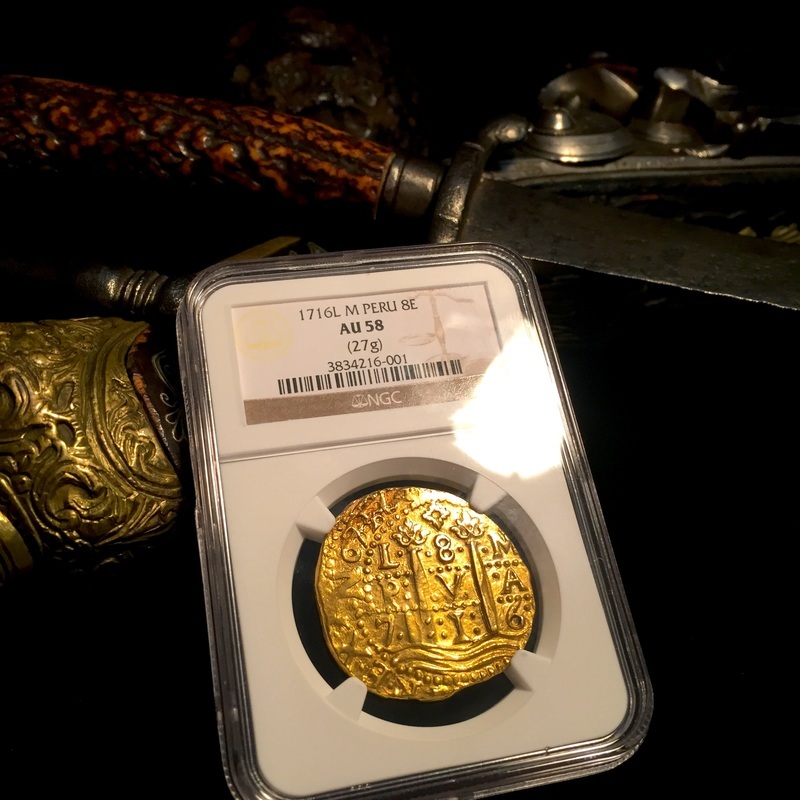 EXTREMELY RARE – LITERALLY ONLY 3 (now 4 as of 6/2015) EVER CERTIFIED AND THIS IS BY FAR THE FINEST KNOWN! 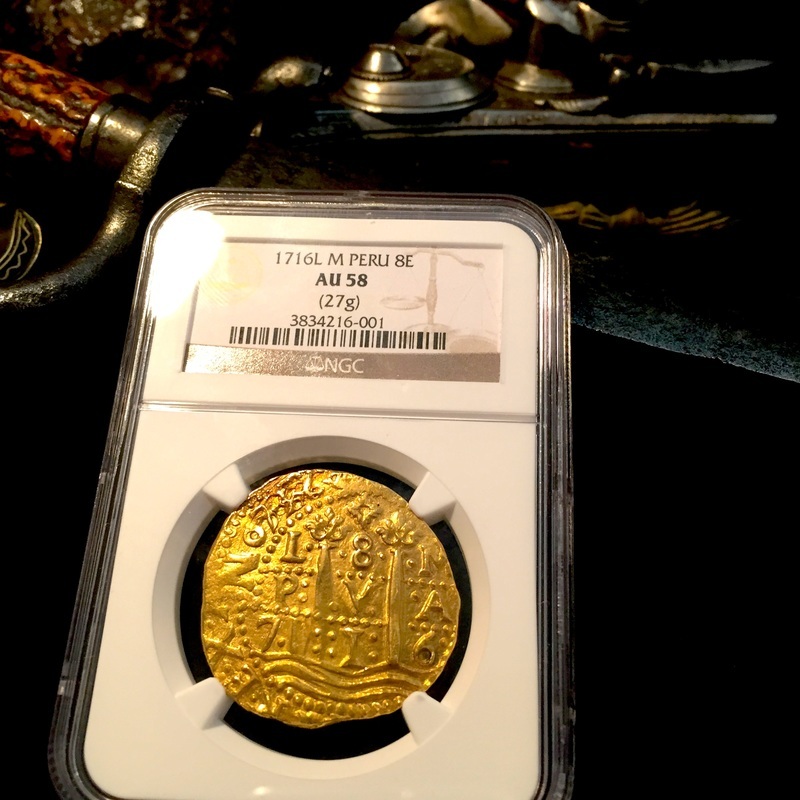 THIS "PIECES OF EIGHT" IS VERY SPECIAL AND UNIQUE IN THE SENSE THAT IT IS A "SINGLE YEAR TYPE." 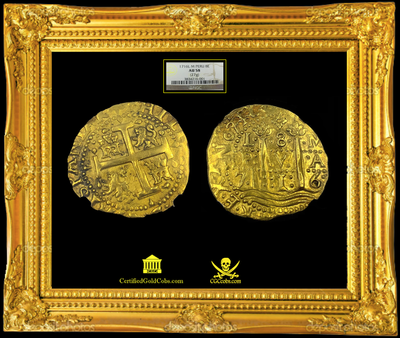 IT'S THE ONLY YEAR THAT THE ASSAYER "CRISTOBAL MELGAREJO" EXPERIMENTED AND ALTERED BOTH SIDES OF THE GOLD COBS. ON THE FRONT (PILLAR SIDE) THE HORIZONTAL ROWS ARE SEPARATED BY "DOTS" VERSUS THE TYPICAL "LINES." ALSO, ON THE FRONT SIDE, CRISTOBAL ADDED DOTS FLANKING THE LETTERS AND NUMBERS INSIDE THE "PANELS." ON THE REVERSE (CROSS SIDE) HE ADDED 12 MORE "TEAR DROPS OR DROPS OF BLOOD DRIPPING OUT OF THE CROSS." THIS IS THE "ONLY" YEAR THIS WAS DONE (BOTH HORIZONTAL DOTS FOR ROWS & DROPS OF BLOOD), HENCE THE "SINGLE YEAR TYPE." I REFER TO THIS EXAMPLE AS THE "ORNATE TYPE." DERIVING IT'S NAME FROM THE ATYPICAL "4 POINTED ORNATE RADIANT STAR" DIE ABOVE THE "8" IN THE FRONT SIDE – CENTER PANEL, BELOW THE CROWN. THIS BRIEF RE-DESIGN WAS DONE BY VICEROY EL REY. 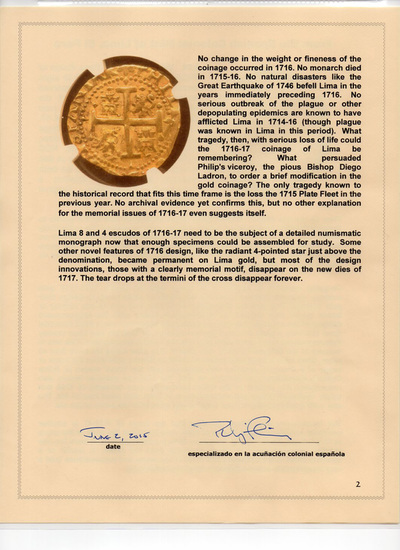 IT'S COMMONLY BELIEVED (BY SPECIALIST IN THIS FIELD & AUTHORS) THAT THESE "BLOOD DROPS," OR THE "BLOOD CROSS" WAS MOST CERTAINLY DONE AS A COMMEMORATIVE (MEMORIAL) PIECE AND IN MOURNING FOR THE LOST OF THE 1715 PLATE FLEET LOSS, THE LARGEST IN SPAIN'S HISTORY, WITH A LARGE LOSS OF LIFE AS WELL. 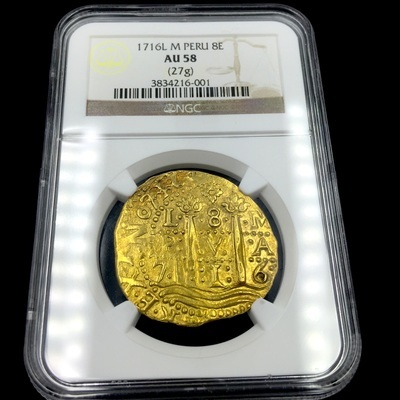 THIS PIECE IS INCREDIBLE ROUND AND ABSENT OF "ANY" FLAN / PLANCHET CRACKS OR ANY OTHER DISRUPTIONS. THE 2ND DATE IS VERY LEGIBLE AND VISIBLE. 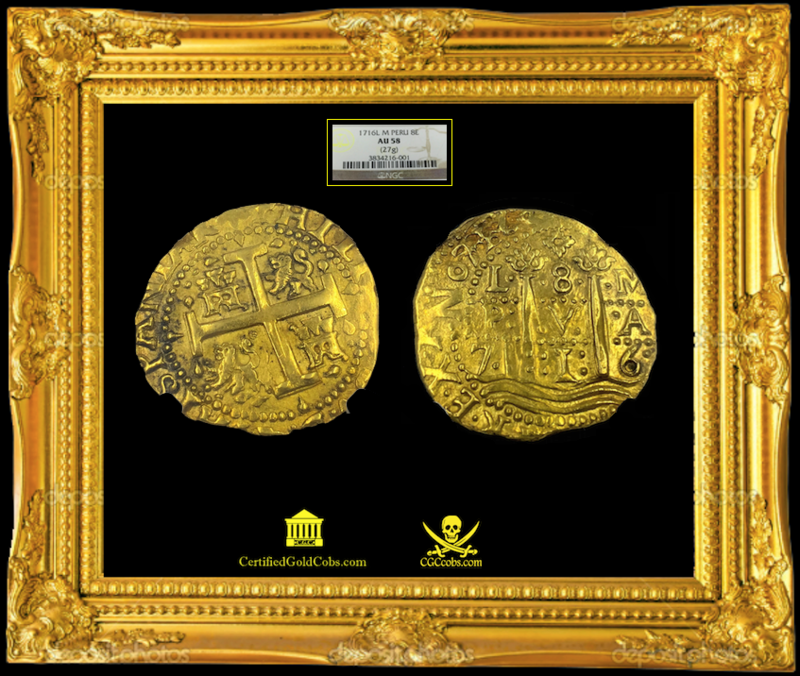 THE SHIPWRECK OF 1719 OFF THE "ISLE OF WIGHT" VESSLE VOC MERCHANTMAN LOOSDRECHT WAS A VERY VERY SMALL DISCOVERY OF LIMA ONZAS DATING 1715-1717 (AND A COUPLE OTHERS). THIS CARGO TRANSPORT SHIP SUNK OFF THE COAST OF ENGLAND (LITERALLY IN THE ENGLISH CHANNEL) AND WAS BUILT IN 1714 IN AMERSTERDAM BY THE VERENIGDE. 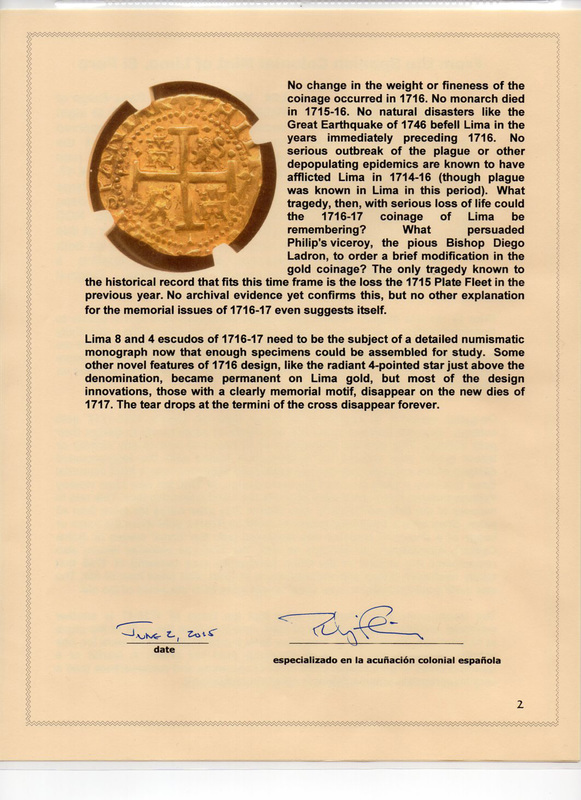 THE CREW OF 212 WAS LOST, AS WELL AS HER BOOTY OF PERUVIAN GOLD COINS. 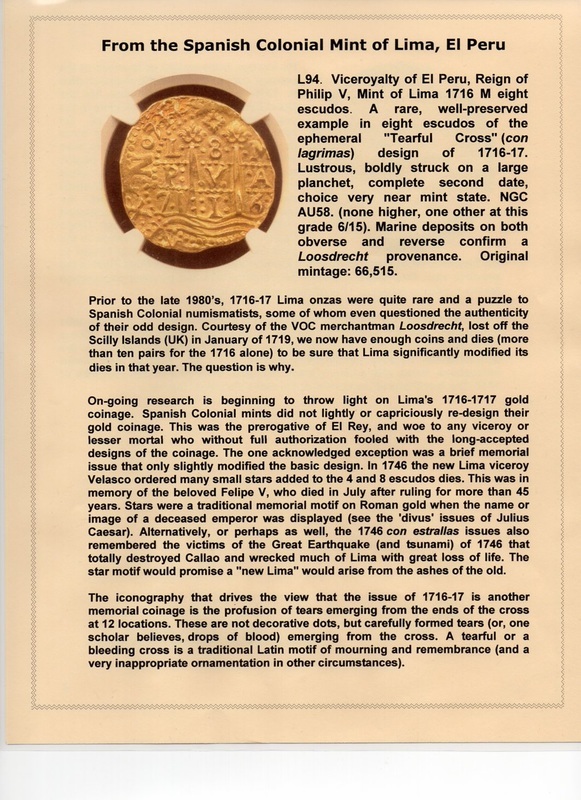 THIS PIECE STILL CONTAINS SOME SEDIMENT AND ENCRUSTATIONS WITHIN ITS DEVICES, CLEARLY SEEN UPON INSPECTION, HENCE THE PROVINCE OF THE 1719 SHIPWRECK! 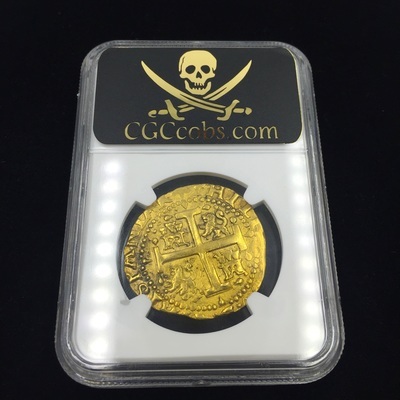 THE FAMED PIRATE "BLACK BEARD" WAS REALLY NEARING HIS PEAK IN THIS YEAR (1716) AT THE TIME THIS GOLD DOUBLOON WAS HAND STRUCK! BLACKBEARD MAINLAND (AS WITH MOST PIRATES) WAS NASSAU (ISLAND OF PROVIDENCE). WHEN HE RAIDED AND TOOK OVER THE CONCORD (THAT HE RENAMED "QUEEN ANNE'S REVENGE) AND LATER RAN IT AGROUND, INTENTIONALLY. 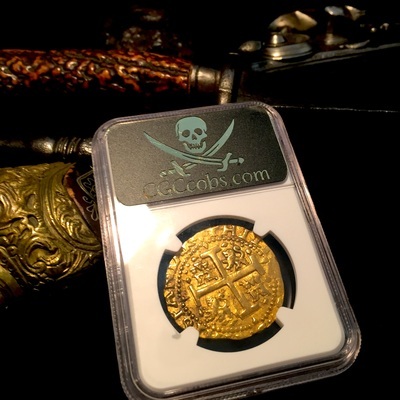 HE DID THIS TO ABANDON OVER HALF HIS CREW (TOTAL CREW WAS ABOUT 300-400) AS TO NOT HAVE TO DIVIDE UP HIS TREASURE INTO TOO MANY SHARES. 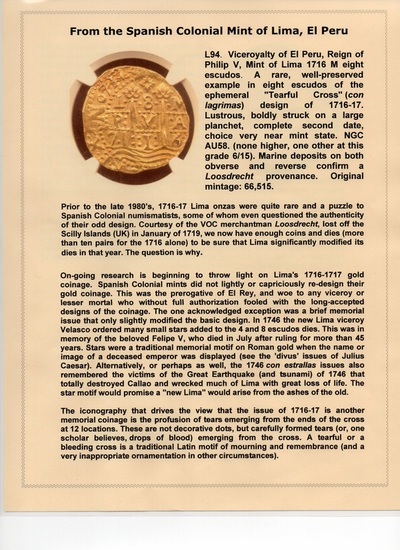 THIS WAS IN 1718 AND ABOUT 6 MONTHS LATER HE DIED, OF COURSE WAS BEHEADED BY ROBERT MAYNARD (ROYAL CAPTAIN) IN NOV. 22ND 1718 OFF THE COAST OF SO. CAROLINA. ALSO, THE PRIVATEER / TURNED PIRATE "HENRY JENNINGS" AND HIS CREW OF 300 SAILED OVER FROM JAMICA (Palmer de Ayes) TO THE SHORES OF FLORIDA WHERE 350,000 SILVER COBS WERE LIGHTLY GUARDED (60 GUARDS) IN A SMALL MAKESHIFT HUT BY THE SPANISH (WHO SALVAGED FROM THE 1715 PLATE FLEET SHIPS) AND CHASED THEM INTO THE JUNGLE AND PILLAGED ALL THE PIECES OF SILVER, WHICH EQUATED TO OVER 10 YEARS SALARY FOR EACH PIRATE). SIMPLY PUT… A ONCE IN A LIFETIME OPPORTUNITY TO CAPTURE THIS EXCEEDINGLY RARE PIECE – DATE "SINGLE YEAR TYPE" BEING THE FINEST OF ONLY 3 (NOW 4) EVER GRADED!!! "FINEST KNOWN - SINGLE YEAR TYPE"